Does the Public Think that Drilling for Oil in Environmentally Sensitive Areas is an End In Itself? NPR told listeners that the public has supported drilling offshore because they objected to the country’s dependence on foreign oil and the wars in the Middle East.This is very interesting because it shows how badly the media have reported on this issue. There are no projections that show drilling offshore will have any noticeable effect on U.S. dependence on foreign oil. The media (including NPR) have horribly misrepresented the potential impact of offshore oil so that tens of millions of Americans actually believe that it has anything to do with dependence on foreign oil. It would have been interesting to report the attitudes towards offshore drilling among those who know that it will not have any noticeable impact on U.S. dependence on foreign oil or the price of gas. Author JonathanPosted on 2010-04-30 2010-04-30 Categories Economics, Energy & EnvironmentLeave a comment on Does the Public Think that Drilling for Oil in Environmentally Sensitive Areas is an End In Itself? I doubt that you’ve missed the flap about Chapter 5 of Steven Levitt and Stephen Dubner’s latest book, SuperFreakonomics: Global Cooling, Patriotic Prostitutes, and Why Suicide Bombers Should Buy Life Insurance (pause for breath). If you have, it’s the “global cooling” chapter, and it’s something of a mess. Neither Levitt, an economist, nor Dubner, a journalist, has any training in climate science—or, for that matter, in science of any kind. But what’s most troubling about “SuperFreakonomics” isn’t the authors’ many blunders; it’s the whole spirit of the enterprise. Though climate change is a grave problem, Levitt and Dubner treat it mainly as an opportunity to show how clever they are. Leaving aside the question of whether geoengineering, as it is known in scientific circles, is even possible—have you ever tried sending an eighteen-mile-long hose into the stratosphere?—their analysis is terrifyingly cavalier. A world whose atmosphere is loaded with carbon dioxide, on the one hand, and sulfur dioxide, on the other, would be a fundamentally different place from the earth as we know it. Among the many likely consequences of shooting SO2 above the clouds would be new regional weather patterns (after major volcanic eruptions, Asia and Africa have a nasty tendency to experience drought), ozone depletion, and increased acid rain. Meanwhile, as long as the concentration of atmospheric CO2 continued to rise, more and more sulfur dioxide would have to be pumped into the air to counteract it. The amount of direct sunlight reaching the earth would fall, even as the oceans became increasingly acidic. There are eminent scientists—among them the Nobel Prize-winning chemist Paul Crutzen—who argue that geoengineering should be seriously studied, but only with the understanding that it represents a risky, last-ditch attempt to avert catastrophe. Kolbert in turn points to An open letter to Steve Levitt, posted by Raymond Pierrehumbert, professor of geophysics at the University of Chicago. The problem of global warming is so big that solving it will require creative thinking from many disciplines. Economists have much to contribute to this effort, particularly with regard to the question of how various means of putting a price on carbon emissions may alter human behavior. Some of the lines of thinking in your first book, Freakonomics, could well have had a bearing on this issue, if brought to bear on the carbon emissions problem. I have very much enjoyed and benefited from the growing collaborations between Geosciences and the Economics department here at the University of Chicago, and had hoped someday to have the pleasure of making your acquaintance. It is more in disappointment than anger that I am writing to you now. I am addressing this to you rather than your journalist-coauthor because one has become all too accustomed to tendentious screeds from media personalities (think Glenn Beck) with a reckless disregard for the truth. However, if it has come to pass that we can’t expect the William B. Ogden Distinguished Service Professor (and Clark Medalist to boot) at a top-rated department of a respected university to think clearly and honestly with numbers, we are indeed in a sad way. A fascinating lesson ensues. Go read. The tubes are abuzz with comment on Levitt & Dubner’s new book Superfreakonomics and its material on climate change. The consensus: at best, lazy and misleading; at worst, dishonest. OK, I’m working my way through the climate chapter — and the first five pages, by themselves, are enough to discredit the whole thing. Why? Because they grossly misrepresent other peoples’ research, in both climate science and economics. Climate Progress goes into considerably more detail. SuperFreakonomics: Global Cooling (and some other stuff)? I liked Freakonomics, so I’m a bit sad to see the (inevitable) sequel being so hopelessly wrong. Probably this is a case of the old rule: whenever you see people write about stuff you know, they get it wrong. Joe Romm has a fairly characteristic attack; and just for a change I’ll agree with him; though he chooses odd bits to assault. It looks like the “global cooling” junk is just one chapter, but of course it is the only one I’ll pay any attention to. Diagnosis, in brief: (1) they write about stuff they clearly don’t understand (2) they pick a catchy reverse-common-wisdom nugget as a headliner without the having the slightest interest in whether it is true or not (mind you, plenty of more respectable folk do the same) (3) they pick an expert to talk to, but since they don’t have a clue about the subject they don’t know how to pick a good expert, or even understand what the expert says (4) there is a grain of sense in there, but so badly wrapped in trash it is nearly unfindable. And last, for now anyway, Brad Plumer. Does “Superfreakonomics” Need A Do-Over? I enjoyed the original Freakonomics quite a bit. It surveyed some fun-to-read economic research that Steve Levitt had done at the University of Chicago, and while a lot of that work was employed in the service of trifling questions (“Do sumo wrestlers cheat?” “Do game-show participants discriminate?”), it was clear Levitt was a clever economist who could gin up fascinating “natural experiments” to crack open everyday mysteries. Levitt now says that the chapter wasn’t meant to lend credibility to global warming denial — but when you open your chapter by giving major play to the false claim that scientists used to predict global cooling, you have in effect taken the denier side. The only way I can reconcile what Levitt says now with that reality is that he and Dubner didn’t do their homework — not only that they didn’t check out the global cooling stuff, the stuff about solar panels, and all the other errors people have been pointing out, but that they didn’t even look into the debate sufficiently to realize what company they were placing themselves in. And that’s not acceptable. This is a serious issue. We’re not talking about the ethics of sumo wrestling here; we’re talking, quite possibly, about the fate of civilization. It’s not a place to play snarky, contrarian games. Oh, what the hell, let’s add one more, with a link to yet another. Matthew Yglesias makes another useful meta-point, and points to the UCS in the bargain. Of course it’s possible that the UCS is mistaken about some matters. And it’s possible that Ken Caldeira is mistaken about some things. But it’s not possible that Levitt and Dubner are correctly representing the views of Caldeira or climate scientists in general. Nor is it possible that Levitt and Dubner are correct when they assert that photovoltaic cells are black (they’re usually blue) nor is it correct to say that black PV cells lead to net increases in global temperature. These mistakes. A mixture of bad science and bad reportage on a crucial public policy issue, done by a writing duo who became famous for clever statistical analysis of trivial matters. Thanks to Michael J Smith for pointing us to James Hansen’s fine takedown of Waxman-Markey. I’m not going to quote much of it here; it’s fairly brief, and nicely written. Please click through and read it. A side note: economists will tell you that, economically speaking, a cap-and-trade system has identical economic incentives to a carbon tax. What they ignore is that a cap-and-trade bill is an embarrassingly easy target for lobbyists to turn into … Waxman-Markey. It didn’t take long for the counterfeit climate bill known as Waxman-Markey to push back against President Obama’s agenda. With the Senate debate over climate now beginning, there is still time to turn back from cap-and-trade and toward fee-and-dividend. We need to start now. Without political leadership creating a truly viable policy like a carbon fee, not only won’t we get meaningful climate legislation through the Senate, we won’t be able to create the concerted approach we need globally to prevent catastrophic climate change. Smith also points us to Joseph Romm’s attack on Hansen’s article, in which he manages to embarrass himself and the Center for American Progress. I won’t link to it here; you can get it from Michael, and you want to read his piece anyway. I just wanted to see if my computer could type those words. His assessment of the Waxman-Markey bill looks right on the money to me. It’s worth reading. It is, actually. I know how Baker feels; I’ve done the same myself ( though I had to look back four years to find it). Author JonathanPosted on 2009-07-01 2009-07-01 Categories Energy & EnvironmentLeave a comment on Thomas Friedman is Right! National Review’s Victor Davis Hanson explained his rationale yesterday for denying evidence of global warming. I just spent a few days in the Sierra in May during freezing cold temperatures and snow; a week ago it was quite cool and raining in New York; each time I have passed through Phoenix this spring it seemed unseasonably cool; and just gave a talk on the Russian River and about froze. Meanwhile the grapes look about ten days behind due to unseasonably cool temperatures. Any empiricist would be worried, as Newsweek once was, about global cooling. Will the planet boil, if we slow down a bit, review the science and dissenting views, and consider the wisdom in a recession of allotting nearly a trillion dollars to changing our very way of life (while the Chinese absorb market share)? Which is by way of context for this graph via Paul Krugman. One of the favorite arguments of climate-change deniers is “but it was warmer in the late 90s.” In fact, the odds are good that I’ll get that argument from George Will on This Weak tomorrow. I basically know the answer: temperature is a noisy time series, so if you pick and choose your dates over a short time span you can usually make whatever case you want. That’s why you need to look at longer trends and do some statistical analysis. But I thought that it would be a good thing to look at the data myself. 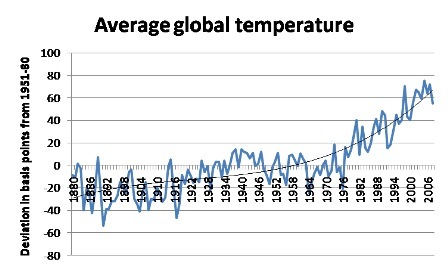 So here’s average annual global temperature since 1880, shown as .01 degrees C deviation from the 1951-80 average. Update: one more thing, also via Krugman. Author JonathanPosted on 2009-06-28 2009-06-28 Categories Energy & EnvironmentLeave a comment on Cooler? Given a choice of three options, just 24 percent of voters can correctly identify the cap-and-trade proposal as something that deals with environmental issues. A slightly higher number (29 percent) believe the proposal has something to do with regulating Wall Street while 17 percent think the term applies to health care reform. A plurality (30 percent) have no idea. The political press has a very strong structural bias toward overestimating the extent to which the public has real opinions about hot political issues. I wish more pollsters would put these kinds of polls in the field that do something to probe the extent of public ignorance. Polls that attempt to directly probe the public’s views about cap and trade wind up measuring a lot of pseudo-opinion. As you can see right in this result, people are incredibly unwilling to admit that they “don’t know” something or other. 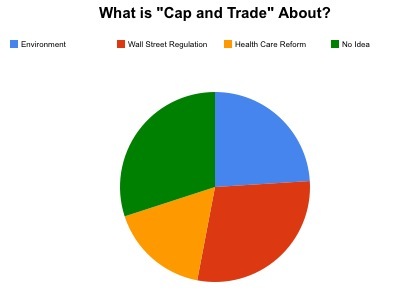 Thus 46 percent of the public says they know what cap and trade is about even though they don’t, in fact, know what it’s about. One of the arguments commonly invoked against global warming “alarmism” is that the models have a significant degree of uncertainty. But that uncertainty cuts both ways. Evidence of ice loss from both poles this week has sparked fresh fears that global warming is progressing faster than scientists had predicted. 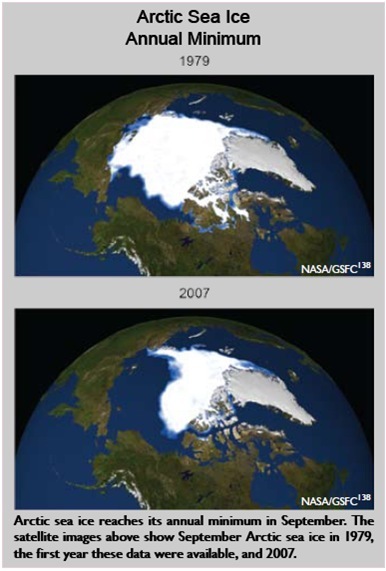 Arctic ice has thinned dramatically, as well as shrinking in area, according to US research. Thin seasonal ice, which melts and refreezes each year, now makes up about 70 per cent of the Arctic winter ice, up from about 40 to 50 per cent in the 1980s and 1990s, leaving far less of the older, thicker ice that is harder to melt. In the Antarctic, an ice bridge connecting an island to the Wilkins ice shelf – a sheet of ice about the size of Northern Ireland – shattered as scientists monitored it through satellite observations. 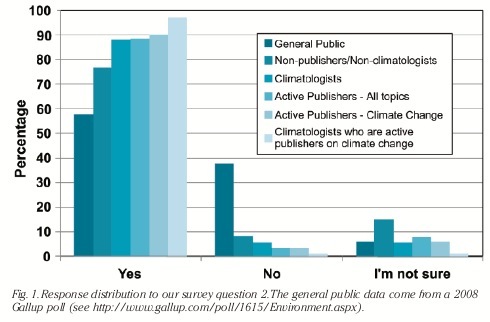 A nugget: Only 47% of petroleum geologists (vs 97% of climate scientists) believe that “human activity is a significant contributing factor in changing mean global temperatures”. Phillip Longman on trains. Here’s a taste, but go read it all. 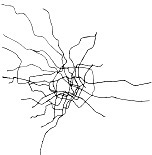 … By all rights, America’s dilapidated rail lines ought to be a prime candidate for some of that spending. All over the country there are opportunities like the I-81/Crescent Corridor deal, in which relatively modest amounts of capital could unclog massive traffic bottlenecks, revving up the economy while saving energy and lives. Many of these projects have already begun, like Virginia’s, or are sitting on planners’ shelves and could be up and running quickly. And if we’re willing to think bigger and more long term—and we should be—the potential of a twenty-first-century rail system is truly astonishing. In a study recently presented to the National Academy of Engineering, the Millennium Institute, a nonprofit known for its expertise in energy and environmental modeling, calculated the likely benefits of an expenditure of $250 billion to $500 billion on improved rail infrastructure. 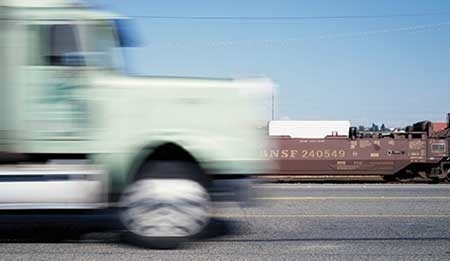 It found that such an investment would get 85 percent of all long-haul trucks off the nation’s highways by 2030, while also delivering ample capacity for high-speed passenger rail. If high-traffic rail lines were also electrified and powered in part by renewable energy sources, that investment would reduce the nation’s greenhouse gas emission by 38 percent and oil consumption by 22 percent. By moderating the growing cost of logistics, it would also leave the nation’s economy 13 percent larger by 2030 than it would otherwise be. The best ways to improve energy security, mitigate global warming and reduce the number of deaths caused by air pollution are blowing in the wind and rippling in the water, not growing on prairies or glowing inside nuclear power plants, says Mark Z. Jacobson, a professor of civil and environmental engineering at Stanford. And “clean coal,” which involves capturing carbon emissions and sequestering them in the earth, is not clean at all, he asserts. 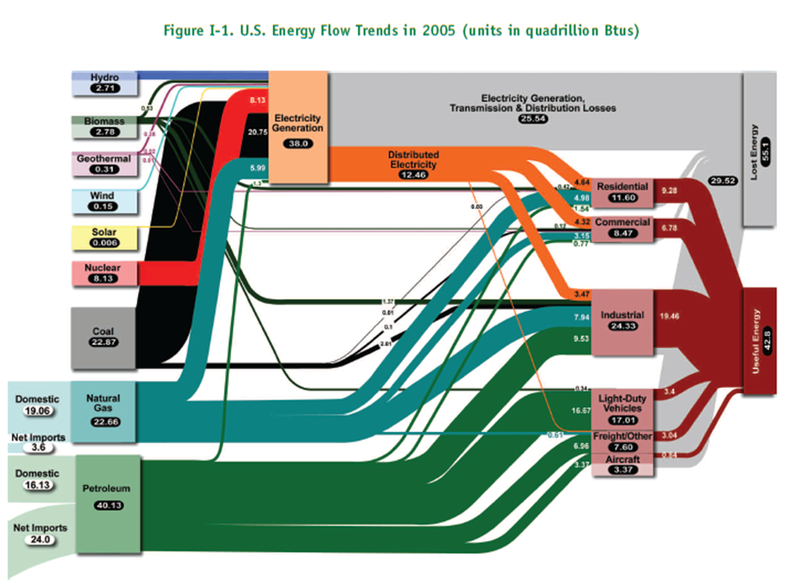 Jacobson has conducted the first quantitative, scientific evaluation of the proposed, major, energy-related solutions by assessing not only their potential for delivering energy for electricity and vehicles, but also their impacts on global warming, human health, energy security, water supply, space requirements, wildlife, water pollution, reliability and sustainability. His findings indicate that the options that are getting the most attention are between 25 to 1,000 times more polluting than the best available options. The paper with his findings will be published in the next issue of Energy and Environmental Science but is available online now. Jacobson is also director of the Atmosphere/Energy Program at Stanford. “The energy alternatives that are good are not the ones that people have been talking about the most. And some options that have been proposed are just downright awful,” Jacobson said. “Ethanol-based biofuels will actually cause more harm to human health, wildlife, water supply and land use than current fossil fuels.” He added that ethanol may also emit more global-warming pollutants than fossil fuels, according to the latest scientific studies. 1. 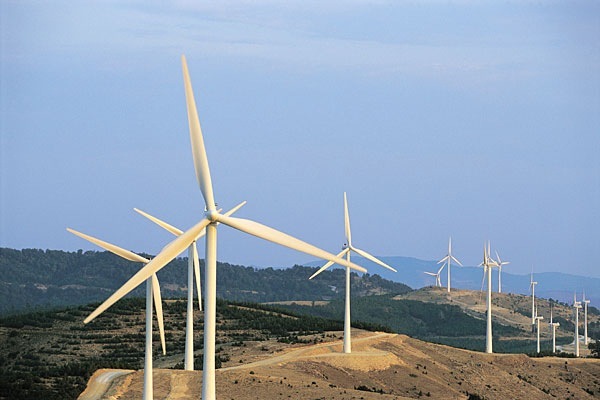 Wind power 2. concentrated solar power (CSP) 3. geothermal power 4. tidal power 5. solar photovoltaics (PV) 6. wave power 7. hydroelectric power 8. a tie between nuclear power and coal with carbon capture and sequestration (CCS). 1. Wind-BEVs (battery electric vehicles) 2. wind-HFCVs (hydrogen fuel cell vehicles) 3.CSP-BEVs 4. geothermal-BEVs 5. tidal-BEVs 6. solar PV-BEVs 7. Wave-BEVs 8.hydroelectric-BEVs 9. a tie between nuclear-BEVs and coal-CCS-BEVs 11. corn-E85 12.cellulosic-E85. From the Guardian. If the find pans out (or whatever the oil-prospecting term is), the political and economic implications are profound. Per capita, that’s a lot of oil. Friends and foes have called Cuba many things – a progressive beacon, a quixotic underdog, an oppressive tyranny — but no one has called it lucky, until now. Mother nature, it emerged this week, appears to have blessed the island with enough oil reserves to vault it into the ranks of energy powers. The government announced there may be more than 20bn barrels of recoverable oil in offshore fields in Cuba’s share of the Gulf of Mexico, more than twice the previous estimate. If confirmed, it puts Cuba’s reserves on par with those of the US and into the world’s top 20. Drilling is expected to start next year by Cuba’s state oil company Cubapetroleo, or Cupet. Author JonathanPosted on 2008-10-18 2008-10-18 Categories Economics, Energy & Environment, PoliticsLeave a comment on Cuban oil? Even when burning fossil fuels, the total climate-changing impact of an airship, according to researchers at the Tyndall Centre for Climate Change Research, is 80-90% smaller than that of ordinary aircraft. But the airship is also the only form of transport which can easily store hydrogen: you could inflate a hydrogen bladder inside the helium balloon. There might be a neat synergy here: one of the problems with airships is that they become lighter – and therefore harder to control – as the fuel is consumed. In this case they become heavier. Michael Stewart of the company World SkyCat suggests burning both gaseous and liquid hydrogen to keep the weight of the craft constant. I like the idea of airships as an alternative to ground transport–cars, trucks, rail. If you’ve ever traveled a significant distance by small plane, you know that the scenic opportunities are vastly better than high-altitude airliner travel. 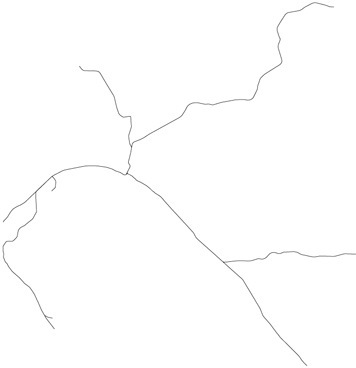 And of course no roads or rails are required. Over at Econbrowser, lots of interesting graphs, speculation and interpretations regarding recent oil production declines. James Hamilton argues against CAFE and in favor of a gasoline tax. CAFE standards are based on the premise that auto manufacturers and consumers are making inappropriate decisions about the kind of vehicles that get produced. The clearest way to motivate this from an economic perspective would be to suggest that there are costs to using gasoline beyond those paid directly by consumers, such as a geopolitical cost when the U.S. relies on imported oil or possible consequences for the world climate. But if that is the motivation, an economically more efficient way to accomplish the objective would be to tax the gasoline use itself so that the after-tax price paid by consumers completely reflects whatever these true costs are deemed to be. This has the benefits of providing an incentive not just to purchase more fuel-efficient cars, but also to encourage more fuel conservation in the use of the existing fleet through such measures as driving slower, driving less, or getting more of the existing mileage from the more fuel-efficient vehicles. And it allows consumers and firms the maximum flexibility to figure out how to do this in the least disruptive way. Hamilton cites research by Stanford economics student Mark Jacobsen. Overall, Jacobsen estimates that a one-mile-per-gallon increase in the required average corporate fuel efficiency would increase the average fuel-efficiency of all new cars sold by 2.5%. However, since most of the older cars would still be on the road, Jacobsen estimates that during the first year, total U.S. gasoline consumption would decline by only 0.8%. He estimates the costs of this 1 mpg tightening of CAFE would be $20 billion in the first year, with these first-year costs shared about equally between U.S. consumers and producers. For comparison, Jacobsen claims that a gasoline tax could accomplish the same first-year effect at an efficiency cost of significantly less than $1 billion. Over time, the fuel savings from tightening CAFE would of course increase, but even after 10 years, Jacobsen concludes that that a gasoline tax could accomplish the same thing at 1/6 the cost. Also: Monbiot’s new book, HEAT, and a website, turn up the heat. My fear is not that people will stop talking about climate change. My fear is that they will talk us to Kingdom Come. Few corporations or public figures are now stupid enough to deny that climate change is happening, or that we need to reduce our emissions of greenhouse gases. Instead, most of them now claim to be on the side of the angels. They make public statements or publish reports designed to persuade us that they are “working towards sustainability”. In a few cases, they really are. But for every genuine reformer, there are half a dozen who are simply greenwashing their existing practices. The people who will destroy the ecosystem are not, or not only – sneering industrialists in pinstriped suits, but nice-looking people in open-necked shirts who claim that they are just as concerned as the rest of us to save the planet. This site aims to ensure that they don’t get away with it. Its purpose is to expose the fudged figures, dodgy claims and empty public relations campaigns of the charming people who are wrecking the biosphere. George Monbiot points out problems with Paul Crutzen’s proposal to mitigate global warming by injecting tons of sulphur into the stratosphere. Challenging a Nobel laureate over a matter of science is not something you do lightly. I have hesitated and backed off, read and re-read his paper, but now I believe I can state with confidence that Paul Crutzen, winner of the 1995 prize for chemistry, has overlooked a critical scientific issue.